THE STORY - From DreamWorks Animation comes a surprising tale about growing up, finding the courage to face the unknown…and how nothing can ever train you to let go. What began as an unlikely friendship between an adolescent Viking and a fearsome Night Fury dragon has become an epic adventure spanning their lives. Welcome to the most astonishing chapter of one of the most beloved animated franchises in film history: How to Train Your Dragon: The Hidden World. Now chief and ruler of Berk alongside Astrid, Hiccup has created a gloriously chaotic dragon utopia. When the sudden appearance of female Light Fury coincides with the darkest threat their village has ever faced, Hiccup and Toothless must leave the only home they’ve known and journey to a hidden world thought only to exist in myth. As their true destines are revealed, dragon and rider will fight together—to the very ends of the Earth—to protect everything they’ve grown to treasure. THE GOOD - Awe inspiring visuals, great music by John Powell, memorable characters and a story that earns its emotion from us by the end. THE BAD - Doesn’t necessarily break any new ground in terms of storytelling. 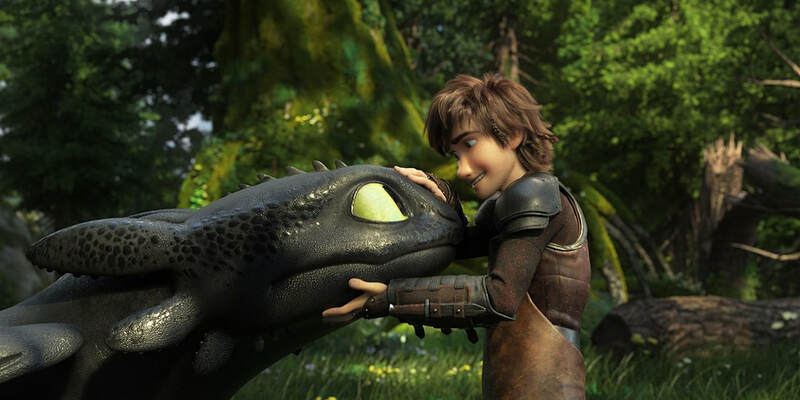 ​Over the past decade, the "How to Train Your Dragon" franchise has been able to stand out from the rest of the animated pack thanks to consistency. That consistency refers to a level of dedication to storytelling and visual language which has allowed audiences to experience something new, fresh, and exciting. With the release of "How to Train Your Dragon: The Hidden World," the third and final entry in the beloved DreamWorks Animation franchise is able to reach new dramatic heights and provide the trilogy with an ending it not only deserves but earns. Our story finds Hiccup and friends still residing on the island Berk roughly a year after the events of "How to Train Your Dragon 2." The death of Stoick the Vast, Hiccup’s father and village chieftain, has left young Hiccup in charge of the island and its many friendly dragons. However, unexpected trouble arrives in the form of Gimmel the Grisly (F. Murray Abraham), a dragon hunter who has his sights set on Hiccup’s beloved dragon, Toothless. As Berkians make a decision to flee for their own safety, Hiccup comes across a mysterious white female Fury dragon who seems to possess a valuable secret. This sets the stage for a story that not only is fun, fresh, and captivating but one that dares to take itself seriously and succeed. Many animated family films end up suffering as a result of too many irreverent jokes and pop culture references. These films are so busy trying to top themselves that they end up losing sight of the story they set out to tell. "How to Train Your Dragon" avoids those trappings by focusing specifically on interesting characters and downright spectacular visuals. Oscar-winning cinematographer Roger Deakins returns once again as a visual consultant, and his thumbprint is apparent. This is an animated film filled with a number of truly jaw-droppingly gorgeous aerial sequences. It would be easy for the third entry in a franchise to begin losing steam. But yet again, the consistency is there thanks to director Dean DeBlois and a creative team of thousands. Having seen the first two "How to Train Your Dragon" films in 3-D, I was interested in seeing how the format worked here. Luckily, it is once again effective due to the immersive nature. The breathtaking flying sequences feel unique because they bring us in, rather than coming out toward us. Even if we are entering a new era devoid of 3-D, I would still like to see unique directors use the format in interesting ways that feel genuine to the storytelling. In 2010, "How to Train Your Dragon" opened around the same time as the much-maligned "Wrath of the Titans" remake. One was praised for its stunning use of immersive three-dimensional technology, while the other was rightly viewed as a gimmicky cash grab. It is clear which has succeeded in the long-run. Though "The Hidden World" is marketed as the final entry in the "How to Train Your Dragon" film franchise, the incredibly moving ending here does lend itself to the possibility of future stories to be told. TV shows, short films, video games, etc. If there is a reason to continue on with this universe, I would be interested in following along. But if this is indeed the last time we see Hiccup and Toothless together on screen, "How to Train Your Dragon: The Hidden World" is a wonderful and rich sendoff.